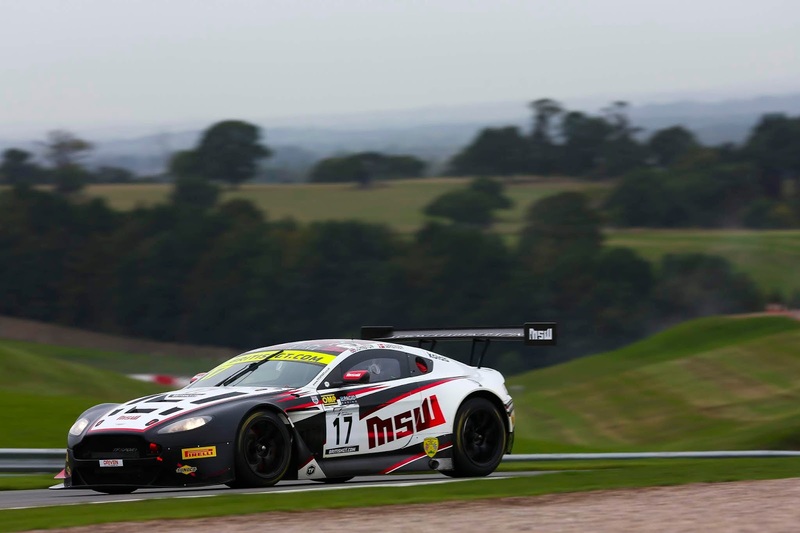 It was great to get down to the Donington Park paddock today in time for the British GT Championship to run out its final Qualification session of the season with both the GT3 and GT4 titles still very much up for grabs. Both TF Sport and the Optimum V12 Vantage GT3's formed the top of the timing screen at the end of Free Practice 1 with then Beechdean and the #11 TF Sport car taking the honours by the end of Free Practice 2 in the dry conditions showing that the V12 was still very much a competitive platform amongst a field of many newer cars despite her imminent retirement as a factory supported platform. Then the rain came just after lunch forcing the teams to make late set up changes to their cars and without the benefit of running it out on track before a timed lap and that must have had an impact on to the following sessions. 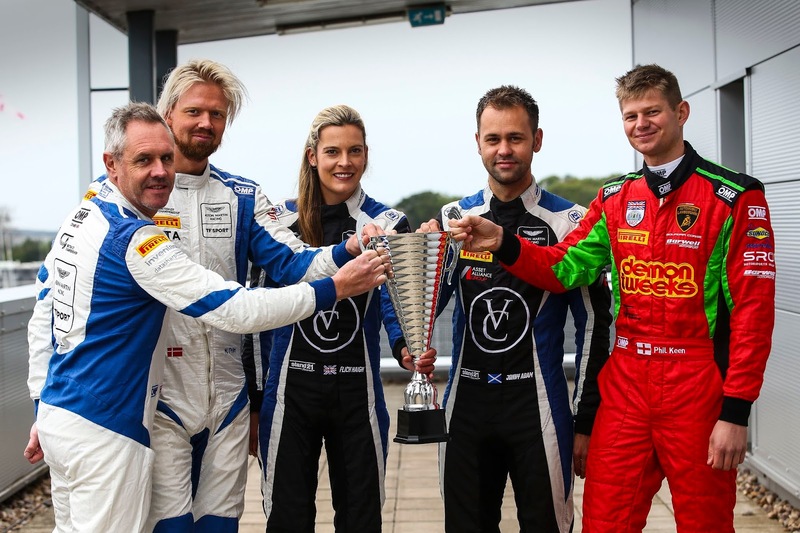 The GT3 Amateur drivers were out first for their ten minute qualifying session with the nearest championship rival to the Optimum crew (the #33 Lamborghini of Jon Minshaw and Phil Keen) taking early top honours with a cool 1.2 second gap to Graham Davidson in his Jetstream Vantage. Both Farmer and Johnston in the TF Sport cars struggled with the conditions with Johnston even having a slight off track excursion that simply lost him any remaining tyre temperature that he had. Worse was to follow as both TF Sport cars even missed the chequered flag to their session and completed an additional lap earning themselves a visit to the race stewards to boot. Hopefully - that will not lead to any grid penalty for tomorrows race? Next up were of course the Pro drivers, with this time both Barwell Lamborghini's locking out the front row with the best AMR car being the Marco Sorensen (again) in forth with three more Vantages directly behind him but with Darren Turner suffering from the effects of a broken exhaust and needing to pit with two laps of time still left on the clock. The overall consequence of the Am and Pro combined times is the the Barwell front row lock out will be followed by the #47 Jetstream car of Davidson and Maxime Martin starting in P3 , the #75 Optimium car in P4, P5 and P6 for the Farmer/Thiim and Johnston/Sorensen TF Sport cars respectively and and Andrew Howard/Turner car down in P8. Over in GT4, the two Academy Motorsport cars of Matt Nichol-Jones with Will Moore and Tom Wood with Jan Jonck showed their clean pair of heels as first Wood and Moore finished P4 and P6 out of the nineteen strong field with Nichol-Jones and Jonck completing their session P5 and P8 respectively. 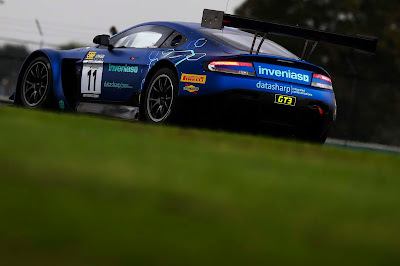 All of that equated to both Academy cars starting their final race aboard their venerable V8 Vantage GT4's on the third row for tomorrows grid. The biggest question for tomorrow remains the threat of rain - if or when it will hit the Leicestershire circuit and the severity and duration of it if or when it arrives. Present Met Office forecasts show a distinct downgrade with the forecast - which is good - so fingers crossed!